The warning crawled across her neck as the sun dropped below the horizon: the boundaries had been breached. Anger at the disobedience flared through her, but she breathed deep, pursed her lips, and allowed the lesson to teach itself. Aliot slumped over, resting her head on her forearms while her lungs laboured to find the breath she had outrun. The cemetery was quiet in the moonlight, the only sound her gasps. Lank chestnut hair fell in sheets on either side of her face, cutting off her peripheral vision. As her breathing slowed, she relaxed her grip on the gunstock, her knuckles popping. How am I going to get out of this? What was that? She yanked her head up and glanced around, eyes darting but never settling. Her own footsteps showed as black hollows in the glowing snow, marking her as an idiot. Aliot winced at the rookie mistake. She was worried now that they had lingered too long in this soulless place of myth and death. The regimented rows of squared marble blocks stretched far off in every direction, the creeping darkness hiding the gates and the way home. The rumours of the evil that abided here drifted into her mind. Her heart pounded twice—hard—before she hauled back her memories from the stories that they told about this place. Why did I listen to him? Mother will be furious if she finds out where we’ve been. Aliot forced her breath to a stop while she listened for sounds of search and pursuit: a crunch through the icy crust of the snow, a snorted breath to clear out for a clean scent trail. No sound reached her, except her increasing heartbeat thumping in her ears. She checked her equipment: pulling loose belts tight, readjusting her boots, rebalancing her grip on the hand cannon. Now you’re just stalling, you coward. Get out there! She puffed staccato breaths, trying to goad her courage into life, and scrambled to the top of the marble memorial. From here, she could see the entire park and any movement between the rows. Aliot leapt from headstone to headstone, angling towards the greater cover of the central mausoleum over to her right. She staggered after the third leap, pinwheeling her arms and poised on one foot. Aliot had almost regained her balance when a sharp jab vibrated through the pack on her back, and her chest guard lit up with an array of LEDs. The cartoon sounds of explosions echoed throughout the cemetery, and the surprise toppled Aliot. She landed on her back, a woof of breath shoved out by the impact. As she lay in a snowdrift, legs angled up with her heels hooked on the edge of the plinth, she stared at the black sky, tattooed with stars and clouds, and gasped for air. “Shut up,” she said, her face burning with humiliation and her back freezing from the press of snow beneath her. Aliot struggled to her feet, dusting off the snow that clung to her as her hands turned red from the cold. Jorge stepped around the grave, sniggering at her defeat and the subsequent glare she gave him. Her brother was taller than she thought he had a right to be: even at fifteen years old, he was nearly six feet tall, and his messy midnight hair made him look much older. Most of her friends pronounced him “gorgeous” and she was jealously certain that several of the girls were only nice to her so they could have an excuse to talk to him—which meant mainly giggling so much that Aliot wanted to slap them for being so obviously vapid. Aliot, caught up in these resentments, had to rush to catch up to him as he strode through the rows towards the gate. She had turned thirteen this past autumn, growing just enough to reach her brother’s shoulder, and finally stopping him from using her as a ‘resting post’, thumping his elbow onto her head and leaning with all his weight until her knees gave way. Aliot barrelled into Jorge with a full-body shove, just for being him. He stumbled to one side and recovered, looking back at her over his shoulder, a half-grin on his face with a twinkle of jovial malice in his eyes. “Oh, so that’s how it’s gonna be, eh?” he asked, his voice rising and falling with playful tones of threats. “Sore loser, you’ll be a snowman when I’m done with you.” He scooped up a double-handful of snow, his eyes gleaming from under the fringe of his midnight hair. Aliot took a half-step back, her hands facing out for protection, her protests broken up by giggles. “We’ve got to go, you know. Mother will be angry, like you said. All those stories…” Her voice trailed away as Jorge loomed towards her. A huge mound of snow was piled in his hands, and he began to laugh: a cartoon evil “Moo-ha-ha!” rolled across the field of the dead. Aliot’s giggles followed in a merry chase, as brother and sister ran in varying pursuit after each other, playing in the snow, Mother forgotten again. While the stars and moon looked down dispassionately, another set of eyes smouldered. How dare they? How very dare they cavort in my demesne? Jorge crowed victorious, head thrown back and mouth wide, while Aliot shrieked and danced about, trying to shake out the snow that had succeeded in slithering under the collar of her coat and down her back. Clouds scudded across the sky, covering the moon in fitful starts, making odd patterns of light on the snow. She did not—she could not—see that she had danced her way around to the lee side of the mausoleum, close to the edge of an open grave cut into the ground before the winter snows had fallen and frozen the earth. The last clump of snow slipped out from under the hem of her coat, landing with a wet flump just behind her. Aliot sighed with relief, her face red from the exertions. She grimaced at her brother, who was perched on the corner of a gravestone just a few feet away, grinning in return. Whites of eyes revealed, mouth curved into an O, and Aliot was gone, leaving Jorge staring at the space where she had been. Stunned, Jorge blinked. “Aly?” Only silence answered him. “Aly?” His voice rose with the rising fear in his heart. “C’mon, kiddo, you can’t be messing around like this. Mother will want us home, like, now.” He slid off the cold marble, and took a tentative step forward, craning his head to see where she went. The grave was not speaking, and he could not see Aliot in the shadow below. Jorge peered closer at the snow lipping the edges of the hole. He spotted claw marks that started in the snow, disturbing the virgin crust of ice, and cut back towards the grave, disappearing over the edge. His breath tripped in his throat as it became clear that Aliot did not fall, but was pulled. He dropped to his knees at the edge and leaned forward, searching. 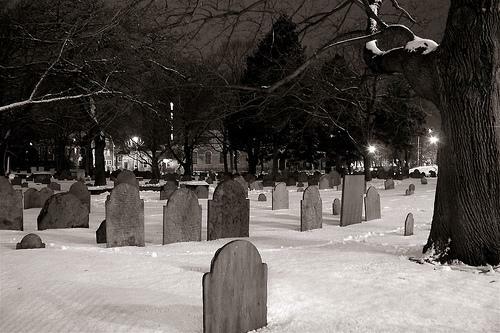 The nape of his neck crawled as he found more scratches in the frozen mud on the inside of the grave. A low groan from the blackness made him scramble back to safety. He whispered his sister’s name to the grave, a question asked in hope. But he did not—he could not—approach the grave again, as fear began to uncurl in his belly, sending tendrils of chills along his limbs and spine. Jorge began to shiver, despite the sweat freezing on his forehead. Ignoring the bite of snow, he crawled forward to the edge again. The blackness of the empty hole was rich and unending. How did we miss seeing this? It’s huge. Jorge stopped three feet from the edge. He swallowed hard, forcing his stomach not to upend its contents into the hole in front of him. She’ll never forgive me if I barf all over her. He tried to crawl forward, but felt as though he was pushing against a tangible obstacle. He paused and reached out with his hand to feel for the thing that was stopping him. He reached past the point—the obstacle suddenly gone—and over-balanced, landing in a shallow belly-flop, facing the open grave, his hand touching nothing in the air above it. Ice cold crept along his finger tips, and even in the moonlight, he could see the flesh turning blue, tracing the movement of the cold as it drew spirals around each finger. Jorge gasped, feeling his own blood draw the cold through his arm. The shadows in the grave shifted, moving with feline grace, revealing the broken body of his kid sister, twisted on the frozen soil below. Jorge twisted abruptly, nearly sending himself into the hole, as he hunted for the source of the voice. He could feel needles of cold enter his ears, piercing his mind. He worked to quell the new surge of fear. “She’s fine,” he said to the empty night. “She’s only joking about with me. Aly’s like that.” The words sounded hollow in the darkness. With the generous arrogance of a boy on the brink of manhood, he had dismissed all the folklore of this place as mere stories to frighten naughty children into goodness. “No!” His shout was amplified by the grave. “Give her back; she is not yours.” Jorge could see Mother’s reaction if he came home with the news of Aly’s death. The image of her disappointment—and of the blame that she would direct at him—etched itself in his mind. The shadow swarmed up the side of the grave. Jorge kicked away from it, scuttling backwards, and stopped short as he slammed into the edge of a headstone. The sudden pain brought him back to rationality. He stared at the shadow before him, and tried to recall those stories for any hint of how to escape the Blue Lady. Whirling like a tornado, the shadow shaped into a human form from the ground up. The figure pulsed once and settled. The blackness tore near the top of the figure, pulling back on itself to reveal its face. Its skin was tinged death-blue, and every feature was sharp, defined by angles and cutting edges. Its prominent cheekbones made hollows of its cheeks, and its predator’s smile revealed needle-sharp teeth. But the eyes were just holes, revealing the darkness within. The Blue Lady regarded Jorge, its face tilted in a caricature of human curiosity. “You think you can defy me?” No emotion, no intonation, no inflection in the voice, just the force of its power as it extended it toward Jorge. The Blue Lady gestured towards the still form in the grave. Jorge’s eyes widened as black tendrils extended from the Blue Lady, reaching down into the grave to caress Aliot’s cheek, the flesh stiffening into rigor even before the cold could touch it. The Blue Lady flowed down into the hole, clasping Aliot’s body to itself, in a parody of a maternal embrace. Jorge raked at his face, trying to think of a way to save his sister. If she is—truly is—dead, then I cannot leave her. If only I had listened to Mother’s warnings… If only I hadn’t lied… If I could only get Aliot to move. The toy gun knocked gently on his head with every pass of his hands. He stared at it, his eyes unfocused as he tried to think. His eyes grew large and Jorge grinned with desperation and relief. “I have here,” he said, “the latest technology of reanimation.” Jorge held up the toy gun and, with showy deliberation, levelled the muzzle of the gun at the still form of his sister. He breathed a silent prayer to whatever guardian angel was listening, and pulled the trigger. Cartoon noises clashed against the solemn silence in the pit, and the chest pack lit up in a blast pattern of red and orange. But it was the vibration of the pack that set Aliot’s body to dancing within the Blue Lady’s embrace. Her torso jerked side to side, and the momentum carried through her limbs, but the motion fooled no one. Jorge let the gun fall and hung his head. His rage had become fear, transformed by desperation and failure and the mocking voice of the Blue Lady. Jorge could hardly believe what he was hearing. He thought of Mother again, hoping that this was the way out of his lies and he could start fresh. He dared to smile when a crack of noise jolted him from his inward stare. His leg gave way beneath him; a searing pain blinded his vision with red. Jorge collapsed, his left leg broken and jutting out above the knee. Another crack, and his left arm was wrenched behind his back, flopping at the elbow and the forearm kinked in the opposite direction. He doubled over, leaning into the open space above the grave, screams tearing from him with steel barbs. He felt, rather than heard, a hollow pop coming from within himself, and the dull, spreading numbness told him something inside had ruptured. Even as he suffered, Jorge kept his eyes on his sister, and wondered what would happen next. He searched for some indication that her injuries were healing, that each one was being transferred from her to him, and that he would take her place in the grave. But the moonlight had clouded over, giving only glimpses of the body below. Jorge lifted his gaze, reluctant to look at the Blue Lady. His body was wracked with agony, his heart filled with hate and longing. Jorge could only ask the question with his eyes, for his throat and mouth were filling with blood and he could barely choke the next breath past the bolus. Jorge dropped his head, coughing out blood, and felt his body go weak from the pain. He lay down on the ground and rested his head on his one good arm. He could not stop the blood bubbling from his mouth. The clouds flitted across the moon’s face, wiping it clean and illuminating the grave, allowing Jorge one last look at his sister. Aliot was twisted, her limbs at painful, broken angles, and blood had smeared down across her chin. Her eyes were open but sightless, pointing up to the open sky above. He could see a faint expression of fear imprinted on her frozen face, but Jorge thought that at least she looked mostly peaceful. The Blue Lady rose to stand by Jorge’s feet. Its face loomed above him, the mouth shaped into a rictus as it leered down. Moonlight pierced through the shadow, making the empty holes glow white, eerie against the eternal dark of the creature. “You are mine now, and will nourish me.” The mask was swallowed back into the darkness and the amorphous form of the Blue Lady moved in lapping waves up Jorge’s legs, spreading and covering him, swallowing his fear and his love. Cold replaced pain. Jorge could almost see the golden aura of his own life seep from his every breath, hovering in the air before him. Mother, I’m so sorry. I didn’t mean to hurt you or Aliot. Forgive me. He watched as the shadow enveloped his legs, creeping along the length of his body, and he let his tears fall freely. Jorge slipped into the grave, escaping the sight of the punishment he knew Mother would exact. He slid his arm under Aliot’s shoulders and raised her to a sitting position, resting her back against the wall of the grave. He chafed her hands and arms and face as her life force returned and her body healed. She tried to ask a question, but he shook his head and gestured up towards the world above. He mouthed Mother, his face gone pale in the moonlight. Aliot’s eyes widened and she shivered, lips drawn down as she considered how Mother would punish them for lying to her. They waited for Mother—shuddering with the fear of naughty children caught—as the howls of torment rolled across the cemetery grounds before ending with a squelch. This entry was posted in Issue 14:1 and tagged Contest Winners, Dead of Winter, Fiction, Lynn Bauman-Milner by TC Editors. Bookmark the permalink.